This page lists upcoming and previous conferences and symposia organized by ISHN and its partners. 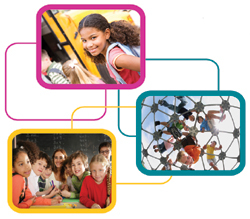 Organized by ASCD, ISHN and the North American Cross-Sector Network/Exchange among Organizations working with Schools working with schools on Health & Social Development in cooperation with several American and Canadian organizations. Held in conjunction with the Annual Conference of the Society for Public Health Education. This invitational two day North American workshop focused national, federal and state/provincial leaders on the challenge of integrating health, equity, social, sustainable development programs and multi-intervention approaches within the core mandates and primary concerns of school systems. Moving the focus away from educators and individual schools, this forum examined structural, systems-based, capacity-building and incremental strategies that help to overcome the barriers to sustainable, long term strategies that shift the thinking and policy-making in non-educational systems from that of asking educators to do more to that of giving what they can. This profound shift needs to be more than health, social or other sectors simply providing advice to educators on programs but is actually asking those sectors to include ongoing commitments of staff time or other resources to help schools identify heath issues relevant to them, to develop long term plans linked to their school improvement objectives, coordinate interventions delivered by other agencies, provide school-based preventive health services or link those services more closely with schools, support coalitions and coordinating committees and more. Strategies such as embedding health into school improvement planning, supporting dropout/student absence prevention programs, re-organizing health promotion to promote health/social development while integrating the responses to latest urgent disease or problem, maintaining different mechanisms for joint ministry/agency planning, action and reporting, using research and insights from the disciplines or organizational and educational change, aligning the efforts of health, law enforcement, mental health, addictions and welfare sectors will be discussed. The program for this workshop also discussed some of the issues identified by an International Discussion Group that is supporting webinars and other web-based discussions of an extensive knowledge development agenda on how health, social, welfare, law enforcement and environmental sectors can work within education systems. Keynotes and working sessions illustrated different aspects of a global consensus statement being developed by educators around the world. ISHN is pleased to be working with the Association for Supervision and Curriculum (ASCD) organize a series of symposiums to address the theme of integration of health and social programs within education systems. 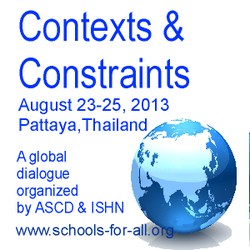 The first of this series was held prior to the IUHPE Conference in Pattaya, Thailand. There is an ever-increasing awareness that school health and development programs must take into account, even begin with, a deep understanding of the local community and country contexts that will determine the urgent health and social needs of students and the capacities of school, health and other systems to address these needs in an effective and sustainable manner. The Institut de la Sante Publique du Quebec (INSPQ), the Canadian Association for School Health (CASH), the International Union for Health Promotion & Education (IUHPE) and the International School Health Network (ISHN) were pleased to invite their colleagues from around the world to join them in discussing new approaches to school-based and school-linked health promotion, safety, social and sustainable development on November 28-29, 2011 in Montreal, Quebec, Canada. The themes of the conference revolved around the new understandings that researchers and practitioners have developed over the past two decades. Key concepts and their applications such as context, complexity and capacity can lead to more effective integration of the core mandates of school , health and other systems so that programs and services delivered through the school milieu can be both effective and sustainable. local context will determine much of the capacity of the school and local agencies to sustain programs as well as be the source of issues and needs that need to be addressed. Consequently, we need to develop approaches and programs that address the needs of specific communities such as low income countries, disadvantaged urban neighbourhoods, isolated rural communities, aboriginal communities, communities disrupted by war and disasters, and faith-based schools/communities. We need to address the needs of the whole child over the life course (addressing issues relevant to the stages of child development and in differentiating programs by the levels of schooling (pre-K, primary, secondary, post-sec) and ensuring successful transitions between those levels of schooling. In addition to selecting evidence-based programs, we need to use evidence-based implementation plans and strategies. We also need to learn how to build other operational capacities at all levels in in the school and other systems and agencies (World Health Organization, 2003) such as coordinated policy, assignment of coordinators at all levels, formal and informal mechanisms for cooperation, ongoing workforce development, regular knowledge exchange, regular monitoring and reporting and explicit plans for sustainability. We need to better understand how open, loosely-coupled, bureaucratic systems can be changed and shift our attention to other levels within the systems rather than always describing what front-line workers in schools need to do. Organizational cultures, management styles, middle managers, readiness for change, employee concerns, norms and perceptions about health and their professional roles, social adaptation as the basis for staff development are all concepts that need to be considered and applied in school health promotion policy, practice and programs as well as research and knowledge management. Considerable progress has been made in the past two decades in understanding school health promotion (St. Leger et al, 2007, Roberge et al, 2009, Stewart-Brown, 2006). We know that individual interventions such as health education, school services and agency/school policies can have limited but specific benefits. We know that coordinated, multiple-intervention programs are more effective and can change child and adolescent behaviours as well as influence educational achievement and school effectiveness. However, we need to move beyond controlled trials and pilot projects to truly embed or integrate health, safety and social development programs within the fabric of the school. We need to enable and empower local communities, agencies and schools to select evidence-based programs to meet their needs and priorities from an array of options and approaches. We need to specify how local school boards, health authorities other agencies and several government ministries can change their practices and policies in order to build capacities in schools, working with local clinic and other professionals as well as parents, youth and voluntary organizations. We need to better understand the intricate and complex processes inherent in implementing programs and sustaining and overall whole school strategies, coordinated inter-agency programs and comprehensive approaches at all levels in several systems.